From personal experience, I can testify that there are places in Alaska more remote than this. But, when it comes to the lower 48 states, a spot not far from Thunder Butte was until recently about as far as one could be removed from a McDonald’s restaurant as one can get in the United States. Surely, many would count this as a blessing. Not that I am a particular critic of McDonalds cuisine. There are moments when convenience overrules conscience – or maybe it’s just the rare reappearance of the McRib. Yes, I admit to occasionally being drawn to the purveyor of speedy gastronomy beneath the golden arches. 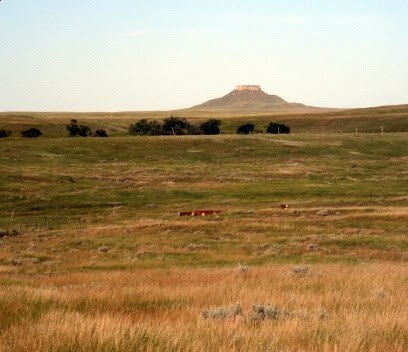 However, if you live around Thunder Butte, that rare treat would cost you over 140 miles of driving. Technically, according to Stephen Von Worley, the farthest spot from a McDonalds in the lower 48 contiguous states was, until sometime in the last year, 7.8 miles WNW of Glad Valley, 15.5 miles ESE of Meadow, 19.3 miles north of Iron Lightning, and 19.9 miles NNW of Thunder Butte Creek – in South Dakota. Yet, holding title to such a storied distinction depends on the vagaries of the fast food business, and the closing of a least one McDonalds unfortunately has shifted the most McRemote spot to an empty locale someplace in Nevada. While disheartening to those around Thunder Butte who aspire to all things out-of-the-way, at least one consolation is that a trip to McDonalds still will cost you over two hours of travel through ranch country that remains mostly devoid of people. "I used to go past their place on the way to the 'Bluegill' dam which was really in the middle of no-where! 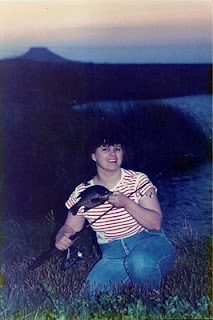 That dam had honest 1 pound bluegills -- that were 10 & 1/2 inches long! Enclosed is a picture of my wife DeeAnn and her "Proud Angler" Bluegill with Thunder Butte in the background." Sadly, Stu reports that the last he heard, the water behind the dam had dried up with the recent drought.